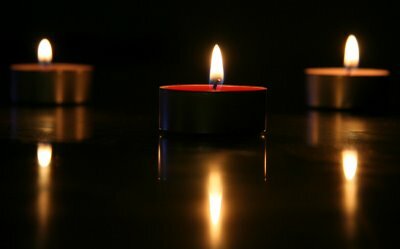 Even though I live miles away from home, I still try and celebrate most festivals, just to stay in touch with the tradition. So this time when I found banana leaves (vazhai elai) in a Korean store, I was excited like a kid in a candy store. 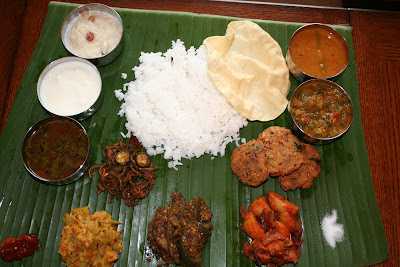 I was so happy that I can serve my complete tamil meal on a banana leaf for the first time. Tamil cuisine is known for its aromatic, flavourful and sometimes spicy food. Tamil cuisine is one of the oldest vegetarian culinary heritages in the world and on most auspicious days only vegetarian meals are prepared. Even among non-vegetarians, ceremonial feasts are always vegetarian. So for Tamil New years day, I stuck to a completely vegetarian menu. Though stainless steel cutlery and crockery are used in urban homes, food is still served, on ceremonial occasions, in the traditional way - on a banana leaf, "vazhaillai", a freshly cut plantain leaf. It is very hygienic and also has medicinal values that have been proved for centuries. Serving always begins with salt and pickle being placed at the corners. 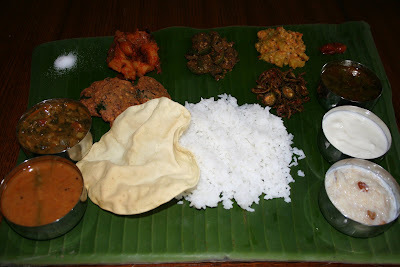 The series of vegetable dishes and the crisp appalam, all of which go with the various rice courses, are placed on the top half of the leaf and the rice on the lower half. The meal starts with the rice, which is generously doused with ghee. Sambhar, the highly spiced dal-based dish containing whatever appropriate vegetable there is in season, follows and this is succeeded by rasam. After a final round of rice and curds, or buttermilk or both, a traditional meal concludes with a small banana, a few betel leaves and nuts. More about tamil cuisine can be found here. My menu for the day was rice, murungakai sambar(drumstick), tomato rasam, paruppu keerai masial(spinach dal), vazhaipoo vadai (banana flower vada), kathirikai podi poriyal (brinjal fry), urulaikizhangu masala (aloo masala), chow chow kootu (chayote squash curry), pavakkai (bitter gourd) fry, appalam (papad), thayir (curd), pickle and semiya payasam (vermicelli kheer). Here are a few pictures from that day. I will post the recipes soon. This is my entry to the RCI-Tamil cuisine event hosted by Lakshmik. Payasam is made at most tamilian homes on special occasions. Be it a birthday, wedding anniversay, diwali, pongal or at homes like mine, just like that. 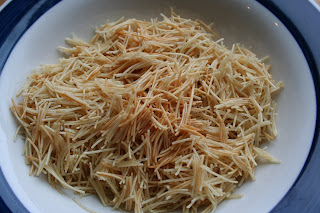 Rice or Semiya (vermicelli) or jawarisi (sabudana) is usually added with milk, sugar and cardamom powder. I like mine not too thick and a little less sweet, cos then it tastes light and refreshing. 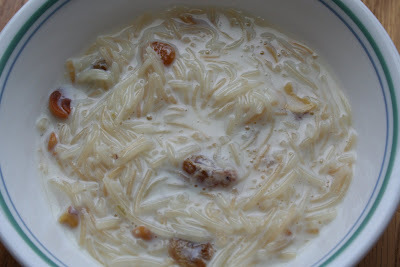 This time I made my all time favorite semiya payasam. Heat 1 tbsp ghee in a pan and fry the raisins and cashwenuts till they turn golden brown. Remove and keep aside. Add 1 tbsp ghee to the same pan and fry the vermicelli till it turns golden brown. Remove and keep aside. Add milk to the pan and let it come to a boil. Add the fried vermicelli and let it cook for about 10-15min. Add sugar and cardamom powder and cook for 5 min. 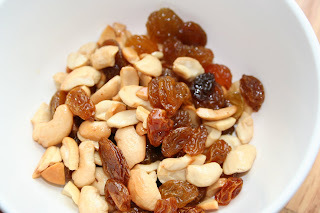 Finally add fried raisins and cashew nuts and remove from fire. It can be served both warm and chilled. Mine was a little elaborate too! Almost 3 hrs cooking!! !Was fun, though! Meera: Mine was not onion free, Sambar, vada and aloo had onion in it. Its too difficult for me to make a lot of onion free stuff. Your Rangoli is awesome. All those school competitions finally paid off, huh! Thanks Meera. Actually I hardly took part in school rangoli competitions. I was mostly the sports and dance kind. 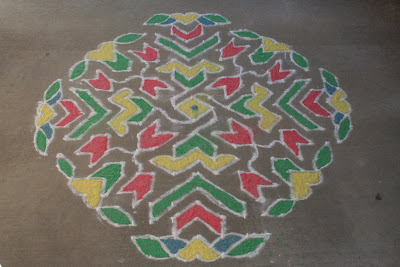 I would have thought that rangoli was too domesticating. Captured the crux of festival food.. Just back linked from tamilcuisine to this page. Wonderful info ! !